Taxon Proboscis Components (mm) Ref. a No detailed studies are available. b World record holder in proboscis length. c Piercing blood feeding and nectar feeding in females. d Functional proboscis length may exceed reported bill length. Rhingia a Secondarily nonfeeding in several taxa. b Unknown whether all are suction-feeding flower visitors. c Proboscis of females specialized to both nectar and blood feeding. FIGURE 9.2 (A) Head and extended proboscis of Melipona sp. (Hymenoptera: Apidae); proboscis consists of galeae (ga), labial palps (lp), and glossa (gl). (B) Close up of the glossal tip. "long-tongued" bees, even basal elements of the mouthparts have a significant influence on a bee's functional tongue length . Remarkably, one group of "short-tongued" bees (Colletidae, Niltonia), which feeds on deep Jacaranda flowers in the New World tropics, has a proboscis that approaches its body length but is composed of the labial palps alone . Another group of colletid bees has a proboscis formed mostly from the concave maxillary palps [27,44]. In long-tongued pollen wasps (Vespidae: Masarinae), the proboscis and food canal are formed from the glossa alone . There are many other compositions found in various groups of Hymenoptera, including Braconidae, Sphecidae, and even in Tenthredinoidea. Overviews on the occurrence and principal compositions are given in Jervis , Jervis and Vilhelmsen , and Krenn, Plant, and Szucsich . In contrast to mouthpart diversity exhibited by Hymenoptera, the proboscides of all "higher" Lepidoptera consist only of the two maxillary galeae enclosing the food canal (Figure 9.3) [20,39,40]. Most Diptera have sponging and sucking mouthparts that are similar in composition but with highly variable lengths. Their proboscis is complex, consisting of an elongated labrum-epipharynx unit and a hypopharynx, which, sometimes together with rodlike maxillary structures, form the food canal and are enclosed by the gutter-shaped labium. 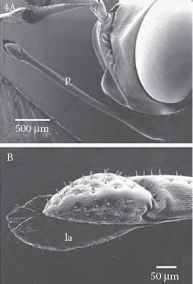 The paired labellae (a homologue to the labial palps of other insects) at the apical end protrude from the proboscis (Figure 9.4) . 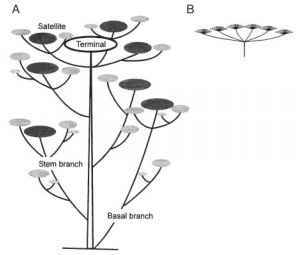 Adaptations to nectar feeding include elongation of the whole functional unit, a simplified composition of the food canal formation, and a slender labellae [27,34]. 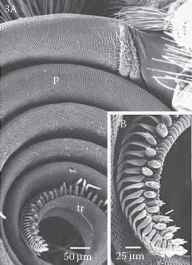 FIGURE 9.3 (A) Spirally coiled proboscis (p) of Vanessa cardui (Lepidoptera: Nymphalidae) in lateral view; tip region (tr). (B) Proboscis tip slits into food canal formed by extended galeal-linking structures; sensilla styloconica (s) are characteristic sensory organs of the lepidopteran proboscis. 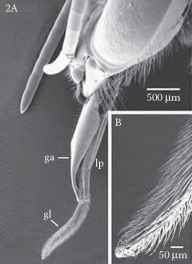 FIGURE 9.4 (A) Head of Physocephala rufipes (Diptera: Conopidae) with proboscis (p) tip projecting forward in resting position. (B) Labella (la) of proboscis tip. FIGURE 9.5 Cross-sections of the feeding canals (fc) of some nectar feeding insects. (A) In Volucella bombylans (Diptera: Syrphidae), food canal is formed by groove and tongue junction of labrum-epipharynx unit (lb) and the hypopharynx (h); labium (l) surrounds the other proboscis components. (B) In Pieris brassicae (Lepidoptera: Pieridae) the galeae (ga) interlock on the dorsal and ventral margins to enclose the central food canal. Dorsal linkage (dl) consists of overlapping platelets sealed by gland cell (gc) substances; ventral linkage (vl) is formed by cuticular hooks. (C) Overlapping cuticular structures of the glossa (gl) form the food canal in Ceramius hispanicus (Hymenoptera: Vespidae: Masarinae). (D) Food canal is formed from the galeae (ga) and labial palps (lp) in Euglossa sp. (Hymenoptera: Apidae: Euglossini), and is disengaged in the resting position. (Figures 9.2B, 9.3B, and 9.4B), and a powerful suction pump (Figure 9.6 and Figure 9.7). These features are integral to the functioning of the proboscis and must be considered in detail before biomechanical generalizations can be developed.